This topic contains 148 replies, has 13 voices, and was last updated by SaintsMan 13 hours, 41 minutes ago. Hi all, after months of waiting my vw Touran petrol auto is finally being built. It was ordered and test driven as a 1.4 petrol auto but this has been replaced with the new 1.5 petrol. Trouble is I am seeing some bad reports about this engine throughout the VW group. Anyone have the 1.5 petrol or know anything about the problems? Apparently the engine is very jerky and kangaroos at low speed. Any help appreciated. Hi CBi69, more good info. There is too much evidence, from owners of all the brands in the VW group, showing this 1.5 tsi engine has a problem. It seems more apparent in manuals. I think that is a very wise decision. Too many issues raised with the 1.5tsi plus VW’s history with dieselgate. bought a 2018 reg Golf 1.5 Tsi 3 weeks ago , wish I had known about the problem of the jerkiness! Having said that the service manager at the dealer was very honest and said they were waiting for a software update. I think it’s going to be hard to update the software and still pass emissions. Id be looking at giving it back tbh. They’ve already tried 2-3 software updates that haven’t cured the problems and I don’t think it can be cured with software since they actually changed the hardware and firing cycle to meet emissions regulations, end result is worse economy, lower power and lumpy running/big power holes in the rev range hence the old kangaroo! Id also be interested to hear if any DSG users have experienced any issues with the 1.5. It’s an engine and gearbox that dominates the schemes choices! It looks like VW will have too abandon the Miller Cycle and revert back to the older Otto Cycle, this will entail camshafts and followers complete with a ECU major programming. As you have already stated it is going to blow all the emissions and fuel economy out of the window. I picked up my manual 1.5 TSi Golf GT a week ago. Now 300+ miles on the clock and I’ve had absolutely no problem with it. No ‘kangeroo-ing’, no lack of power when I accelerate (gently, of course – I’m still running it in). DH (30+ years of driving) has also driven it with no issues. Hot or cold, rain or shine, the engine (and everything else) has been fine. Manual gearbox, also heard that t roc, seats affected with the 1.5 engine, seems some are not affected though? Which is strange. I ordered a 1.5 TSI DSG Passat on 31 December 2018. VW cannot give me a build date and cannot confirm that it will be delivered in 2019. You may be thinking that’s a load of rubbish, well let me also tell you that I have been told by an industry insider that VW are not allowing any new orders for the 1.5 TSI Passat until they can “remedy a minor fault.” How reliable is this information, I’m not sure, but I would take a look in your nearest VW dealers and let me know if there is a Passat in the showroom. I can’t find one in Essex and dealers are trying desperately to offload all used Passat TSI DSG relatively cheaply. 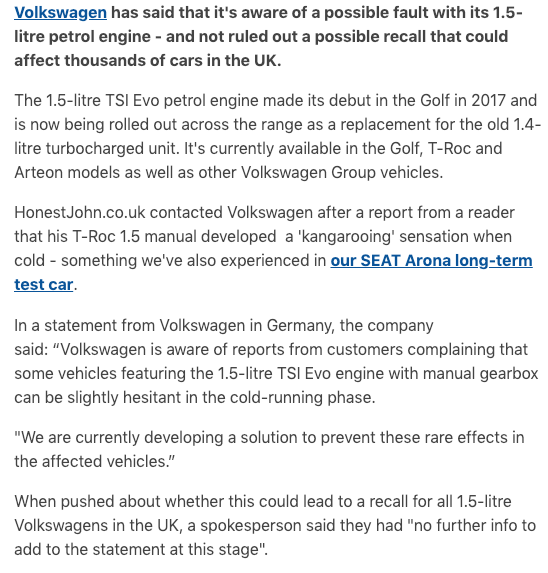 Sorry to ‘bump’ and old thread but back in January HJ reported (extract below) that there was some acknowledgement of the issue by Volkswagen, the other Motoring press seem less interested – i’m sure it has nothing to do with advertising revenue. I’m not against big corporations but following on from dieselgate is this VW using their might to sweep the issue away? Hoping they can come up with a software fix in the future so as not to announce a recall? I have not experienced the issue but there are scathing reports on the T-Roc forum. The new SEAT Tarraco is a cracking deal this quarter using this very engine, I am loathed to recommend the car to people with this in the back of my mind. Not quite a moral dilemma but it is a problem that appears to be dragging on for VW and the PR team must be sick of it. Hi, I think it is important to keep this thread to the fore. As I have reported I cancelled my Touran with this engine after test driving. I had waited 8 months for delivery and had a cracking deal but it wasn’t worth the poor engine performance. This engine is in many models and our members need to be aware so they can make an informed choice. Please keep this issue highlighted. Agreed, highly important. Also issues with BMW DCT 7 speed. At least they admit there is a problem. Will they just go back to the old 1.4 petrol engine? Or design a completely new unit? I know ford also had problems with the early 3 cylinder engines and the 2.3 petrol in the Ford Focus, meaning customers had new head gaskets or in some cases it was too late and a new engine was needed. I read in a leaflet through the door yesterday. Here in Kingston we found out that the Lib Dem council want to charge anyone with a petrol hybrid new or old or any diesel, new euro 6 or older, an extra £50 charge on all on street residents parking permits, they say it will reduce air pollution? plus it includes blue badge holders. We have a drive for 4 cars so it won’t apply to us. But i can’t work out the logic at all? Politicians = Logic? Not usually. I doubt if that the Lib Dem council will invest the money gained, by the new tax, into any Air Pollution Reducing Scheme, the motorist will simply pay the tax as they need their cars, the only real outcome is the Council increase their tax revenue. So in the eyes of the Lib Dem you can poison young children with the fumes for your car as long as you pay for it? Their thinking is as you pay more the air some how gets cleaner? I used to be a runner in my young days and not once did I have a cough or sneezing fit, running through town in rush hour. Like this central London tax, it will solve nothing as it’s a massive city. They want to turn it into a rural Vilage where we all ride bikes? A bit impossible for some disabled folk, myself included. 1.5EVO with DSG and I’m getting cold engine kangarooing and awful gear changes (especially cold 1st to 2nd, 3,500rpm usually). I’ve been waiting on the alleged software update since start of March. Bloody hell ian that’s not great. Most folks with a Dsg box seam to be problem free, I guess the auto box can’t smooth out the misfire in all cases. Hope they fix it soon or tell motability to arrange looking for something else and taking it back. What about mpg ? Some say it’s lower then expected too. Can you expand your BMW DCT7 statement. I can’t see anything on BMW forums.